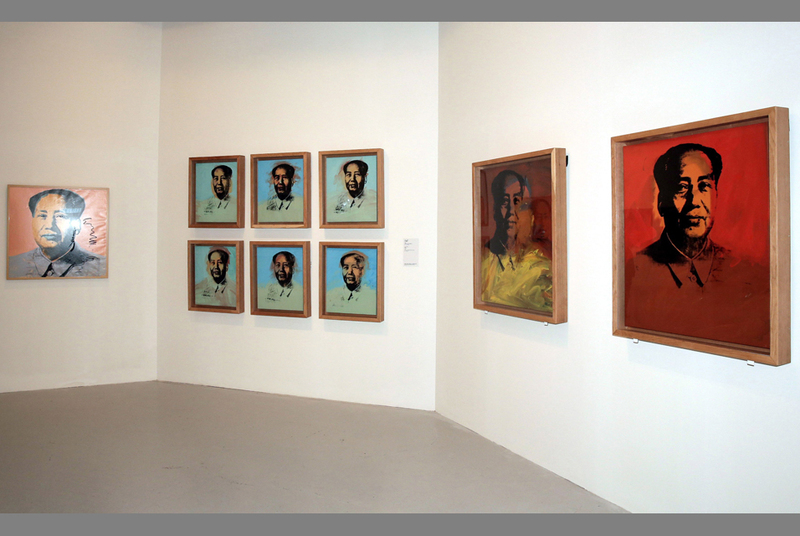 An undated handout photo released by the Hong Kong Museum of Art on December 19, 2012 shows portraits of former Chinese leader Mao Zadong on display during the art exhibition 'Andy Warhol: 15 Minutes Eternal' in Hong Kong. Warhol's iconic portraits of former Chinese leader Mao Zedong will not go on display in China next year at one of the biggest exhibitions of the pop artist's works, organisers said on December 19. The exhibition runs to March 31, 2013 in Hong Kong before travelling to Shanghai, Beijing and Tokyo as part of a 26 month Asian tour to mark the 25th anniversary of Warhols death. AFP PHOTO / Hong Kong Museum of Art. BEIJING (AFP).- Andy Warhol's famous portraits of Mao Zedong will be excluded in a major show of his work in China, organisers said Wednesday, although they stopped short of saying they had been censored. The exhibition to mark the 25th anniversary of the American artist's death, which is currently touring Asia, features more than 300 of his works including 10 acrylic and silkscreen portraits of the former Chinese leader. But the US-based Andy Warhol Museum which is organising the tour said the Mao images will be dropped from the Beijing and Shanghai legs next year. "Although we had hoped to include our Mao paintings in the exhibition to show Warhol's keen interest in Chinese culture, we understand that certain imagery is still not able to be shown in China," it said in a statement, which did not say whether they had been censored by Chinese authorities. Officials at the Beijing and Shanghai cultural bureaux were not immediately available for comment when contacted by AFP. The Andy Warhol: 15 Minutes Eternal exhibition is one of the biggest ever shows of work by Warhol, who died in 1987. The artist was said to have been inspired to create the series of Mao paintings by the historic visit of then US president Richard Nixon to China in 1972. The portraits are currently on display in Hong Kong, the semi-autonomous Chinese city, where the exhibition is scheduled to run until March next year.